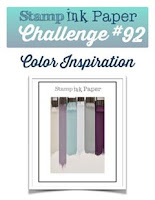 Since today is Tuesday, it means it's time for yet another Stamp, Ink, Paper challenge. This week we have a cool color inspiration challenge photo for you! I loved the look of the stripes of color so I decided to add stripes of ink blending to my background. 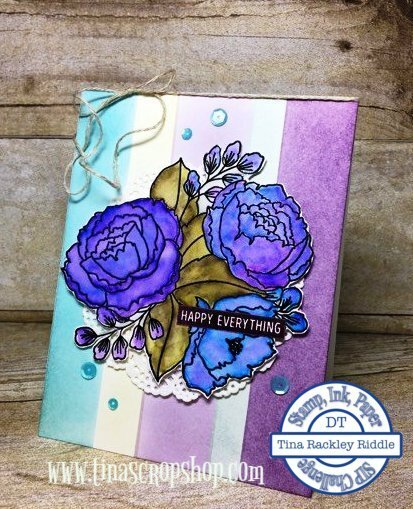 I used the beautiful Mama Elephant Organic Blooms stamp set. Not only do I love the floral image but there are a lot of awesome sentiments in it! I can see myself using these sentiments a lot! I started off with a top folding Neenah Classic Solar White 110# cardbase. The top layer was a 80# Neenah Classic Solar White that has masked stripes for Ink Blending of Various Distress Inks. My Organic Blooms image was stamped in Versafine Black Ink and clear embossed onto Bristol Smooth Cardstock. The image was colored in with Zig Clean Color Marks and an aqua painter. I fussy cut the image out.. that was not fun. I need to check to see if Mama Elephant has dies for this one! lol I layered a doily onto the striped layer and then adhered the floral image with foam tape. The sentiment Happy Everything was first inked with Versamark and then inked with Blackberry Bliss (retired Stampin' Up!) ink and clear embossed. I ran a long strand of Natural Twine across the top of my card and tied it into a bow. I used the side of my scissors to add a little curl in the twine. I then added a few different light blue Pretty Pink Posh sequins to bring in more of the lighter blue color.